As an alternative to the Morgan Dollar, and in honor of the peace accords following World War I, the Peace Dollar was designed, approved and minted. Because of the Pittman Act in 1918, millions of silver dollars were to be minted and, in 1921, production of the Morgan Dollar, and then the Peace Dollar began. From 1921 until 1928 when the fulfillment of the Pittman Act took place, millions of Peace Dollars were struck. Just over a million (1,006,473) Peace Dollars were struck with the 1921 date and were struck during the last 4 days of December in 1921 at the Philadelphia Mint. Due to die stresses from the high pressure required to strike the Peace Dollars, die breaks were common. Production at other mints (Denver, San Francisco) was delayed to reduce this problem. 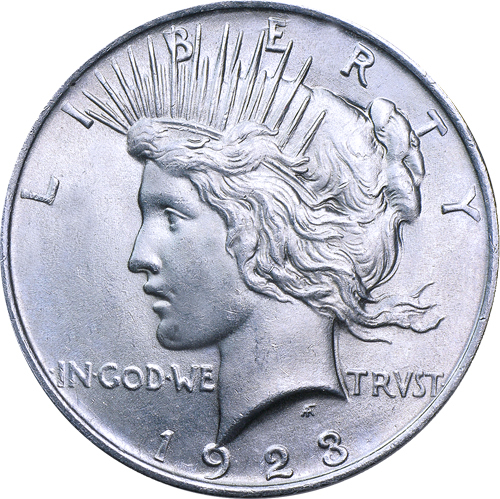 Because of the die weaknesses, a low-relief version of the Peace Dollar was finally fashioned and used for future production at all mints until the cessation of minting in 1928. From 1921 to 1928, over 104 million Peace Dollars were struck and issued. The coin was reissued during 1934 and 1935 with some 7 million coins being struck. Congress passed legislation requiring the U.S. Mint to purchase large amounts of domestic silver. This led to the reintroduction of the Peace Dollar. Due to low demand, the coin was not produced in 1936 and the master dies were destroyed in January, 1937. In 1965, around 300,000 Peace Dollars were struck at the Denver Mint with the 1964 date stamp. Due to the amount of silver contained, the legality of private ownership was questioned as well as the fact the coins would not serve the coinage purposes they were designed to fulfill. These coins were destroyed. All Peace Dollars issued for circulation are 90% Silver and 10% Copper to make them more durable. They are 38 millimeters in diameter and weigh 26.73 grams. Those minted in Philadelphia will have no mint mark while the ones minted in San Francisco and Denver (S and D mint marks respectively) are located on the reverse, on the left side, under the word “ONE”.